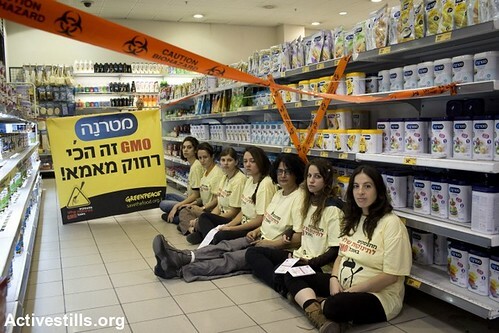 Direct action against GMO, Holon, Israel, 26.11.2013, a photo by activestills on Flickr. 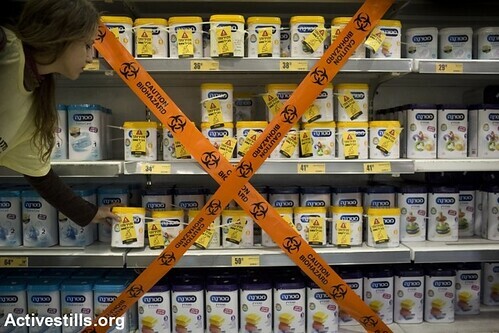 ...activists mark a baby formula that contain genetically modified products (GMO) during a protest inside a supermarket in the city of Holon, calling to mark baby formulas that contain genetically modified products (GMO), November 26 ,2103. The activists labeled baby formulas that contain genetically modified products, and blocked an area i the supermarket for several hours. Greenpeace claims that "Materna" baby food company misleads the public. by marking on the packaging that the food is "GMO free", when in fact laboratory tests have proved the opposite.